The bus driver, Tronalie Mae Draft, 38, of Colville, was seriously injured in the crash and was taken by ambulance to Providence Mount Carmel Hospital in Colville. A hospital spokeswoman said Monday that Draft had been released. Draft was operating a school bus carrying 25 elementary students on Friday morning. State troopers said she failed to yield while turning onto U.S. Highway 395 from Williams Lake Road. 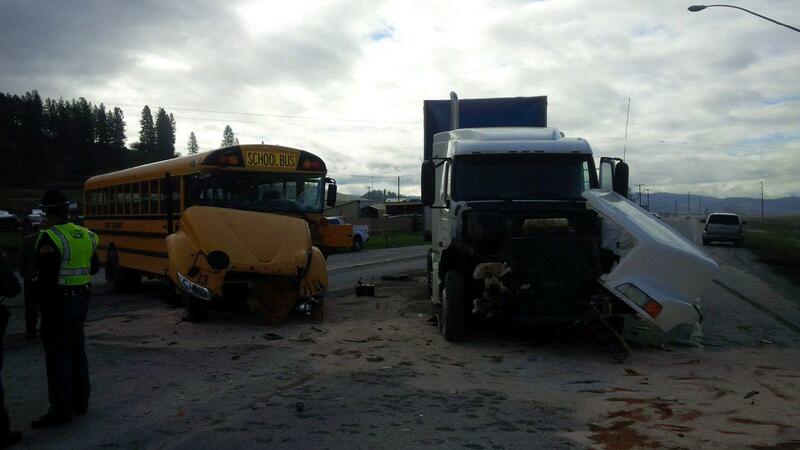 The bus was struck by a northbound semitruck driven by Buddy Lee McBride, 34, of Kettle Falls. Trooper Jeff Sevigney, a WSP spokesman, said Draft’s injuries were serious but not life-threatening. He said a number of children received minor cuts and bruises. Two children were taken to the hospital by ambulance, and others were taken by their parents for evaluations, Sevigney said. McBride, the semitruck driver, was not injured. The WSP said both drivers were wearing seat belts and neither was intoxicated. Both vehicles remained upright during the crash and remained on the highway blocking traffic for more than seven hours, the WSP said. Trooper Sevigney said Monday that no charges against Draft had been filed. The school bus is owned by a company called First Student, which is contracted to provide bus services for the Colville School District. Published: April 17, 2017, 1:27 p.m. Updated: April 17, 2017, 11:05 p.m.